Just wait 'til you see the full title! Good news from D3 Publisher, a name you probably recognize as the publisher of the Puzzle Quest series as well as all those Ben 10 titles you hide in your sock drawer. The studio is teaming up with Cartoon Network once again to release Adventure Time: Explore the Dungeon Because I DON’T KNOW!, a co-op action game currently under development by WayForward! The new Adventure Time game (definitely not typing the whole name out again) will feature a new storyline focused on saving the Candy Kingdom by exploring the Secret Royal dungeon below the Land of Ooo. 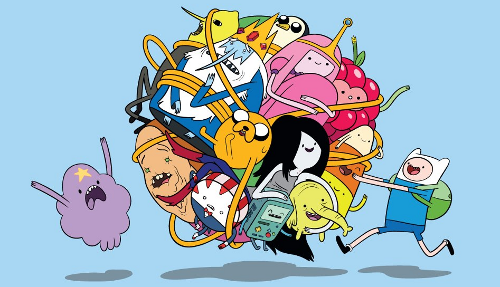 Several voice actors from the show will be making cameos, and with WayForward's talent at producing gorgeous artwork (as evident in Adventure Time: Hey Ice King! Why'd You Steal Our Garbage?! ), it's safe to assume the game will look a lot like the cartoon. Details about co-op are thin at the moment, but we do know four players is the upper limit, the main campaign will be available in co-op, and some of the playable characters include Finn, Jake, Marceline and Cinnamon Bun. Adventure Time: Explore the Dungeon Because I DON’T KNOW! (thanks, copy/paste) is scheduled to hit Wii U, Xbox 360, PlayStation 3, PC and 3DS this fall. Page created in 1.2738 seconds.